Our nerves send information from our brains and spinal cord out over our entire body, as well as taking information from the rest of our body and sending it back to our brain. They allow us to move, sense, feel, think and assist in all of our bodily functions. So when you suffer a trapped nerve, it can be very unpleasant. A trapped nerve is exactly how it sounds – a nerve that is compressed or prevented from moving by one or more contributing factors. Nerves can become trapped anywhere along their route, but this most commonly occurs in areas where the nerve runs through a small space, for example, when it leaves the spine. Cervical (neck) nerve compression can present as: neck, shoulder, arm, hand or facial pain; pins and needles, numbness or weakness in any of these areas; and headaches. Thoracic (upper and mid-back) nerve compression can present as: upper to mid-back pain; chest, rib or abdominal pain; and pins and needles/numbness in any of these areas. 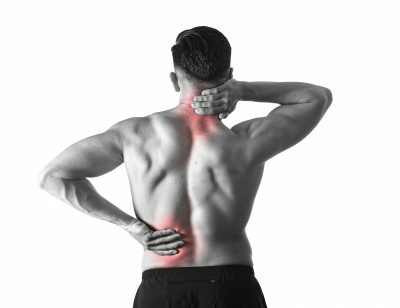 Lumbar (lower back) nerve compression can present as: lower back, buttock, leg, and foot pain; and pins and needles, numbness and weakness in any of these areas. It can also manifest as a lack of ability to lift the foot (foot drop). Pain from this region is often referred to as “Sciatica”. HOW DO TRAPPED NERVES HAPPEN? Trapped nerves can result from varying circumstances. Often, muscle tension or spasm can create increased pressure in the areas surrounding the nerves, resulting in temporary compression. They can also become trapped or irritated during sustained positions or repetitive movements e.g. poor posture from a desk job or repetitive strain injury at the wrist. More severe physiological changes in the spine, such as disc bulges or loss of disc height, scarring, swelling, bony overgrowth or vertebral slipping (spondylolisthesis) can also cause changes to the space the nerve travels through and result in compression, although these are far less common. HOW LONG WILL THE PAIN FROM THE TRAPPED NERVE LAST? Symptoms of trapped nerves will often resolve over a 12-week period, either spontaneously or as a result of intervention. Treatments can range from the conservative to the surgical. WHAT TREATMENT IS AVAILABLE FOR TRAPPED NERVES? Conservative treatment normally begins with use of non-steroidal anti-inflammatory medication that can be prescribed by your GP. The next port-of-call is to be assessed by a Chartered Physiotherapist. A physiotherapist will be able to help you to discover the potential cause for a trapped nerve, restore range of movement and function to the affected areas, reduce your pain levels, improve on poor posture, and give you the tools to help prevent further recurrence of this condition. Further conservative therapy, such as injections and splinting, and their usefulness to you, can be explored with your therapist. In more severe cases, and depending on the structural causes of the nerve entrapment, surgical options are available.